Mumbai-based firms Dhaval Vussonji & Associates and Alliance Corporate Lawyers have merged their practices creating a 40 lawyers team. Dhaval Vussonji & Associates has been regarded as a ‘Recognized Firm’ by IFLR1000 in the areas of finance and corporate laws for FY 2016-2017. Dhaval Vussonji & Associates was awarded the ‘Young & Rising’ Law firm award at the Leadership Summit & Excellence Awards 2017.
d.	Firm’s Co Managing Partner, Mr. Dhaval Vussonji is a ranked lawyer in the Asia Pacific region, by leading international publication Chambers & Partners 2017. 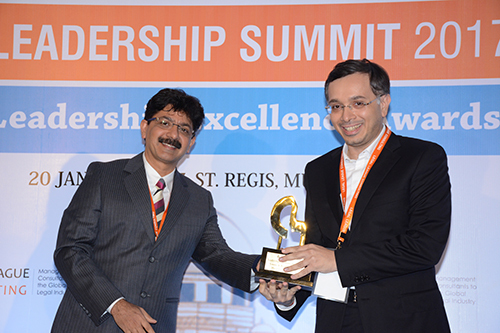 Awarded the Young & Rising Law Firm Award at the Leadership Summit & Excellence Awards, 2017 held at St. Regis Mumbai on 20th January, 2017. 07 Feb, 2017: When Does Cause Of Action Arise In National Green Tribunal? Cheques as ‘security’- Should lenders finally cheer?